Sean Dyche accused Manchester United substitute Jesse Lingard of going down too easily as the home side left it late to grab a point at Old Trafford. 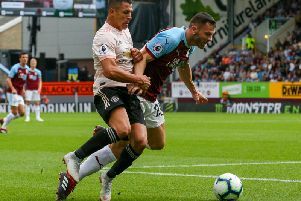 Second half goals from Burnley's strike duo, Ashley Barnes and Chris Wood, had put the away side in a commanding position but, with nine minutes remaining, Lingard went down under the slightest of contact from Jeff Hendrick. The Burnley boss, who feels he is on a one man crusade to kick diving out of the game, felt the England international's fall was animated, with referee Jon Moss wasting no time in pointing to the spot. That incident was a key turning point in the game, sparking United's comeback, as Paul Pogba dispatched the spot kick before Victor Lindelof equalised in stoppage time. "I don’t like it when players get a touch on their shoulder and their legs suddenly don’t work," said Dyche. "I don’t understand that but it is a modern football and everyone seems to think it is acceptable apart from me so therefore I have just got to with it. "That is the way it goes. I am not remotely saying that individual does that all the time, I am just saying that in the modern game these players are incredibly strong and how they got a touch on the shoulder and their legs don’t suddenly work, I just don’t know that is. "But that is the game and therefore you see them given every week." Despite surrendering a two-goal lead for the second season in succession, Dyche was more than happy with a point as the Clarets extended the gap to four points over the bottom three in the Premier League. After becoming the first side to deny Ole Gunnar Solskjaer victory during the Norweigan's short reign, Dyche said: "It is very tough coming here at the moment. We know the difference in feel, a bit more freedom in the players it seems with a very popular figure as manager. "To come here and deliver a very good performance and get a point out of a game that was tight, I am very, very pleased." However, the Turf Moor chief did question the additional five minutes of time indicated by the fourth official at the end of the game. In reference to "Fergie Time", he said: "I have no clue where the mystery five minutes came from. "I don’t think anyone in the stadium did, the stadium had a gasp of where has five minutes come from? "The reason I mention that in these parts with the history of this club, when five minutes goes up everyone believes. Three and I think they think it will be tight but five you never quite know. "I just don’t know where it came from. I asked the officials and they didn’t give me a very valid reason. They seemed to come from somewhere. "I thought the linesman made a brilliant decision on the possible penalty by Ben Mee but then if you look at the margins and VAR and all that, I think, and we have checked it, that when [Alexis] Sanchez wins the header [Victor] Lindelof is marginally offside and as it comes off the keeper he finishes it. "We just said there were no physios on the pitch at all, three goals, three subs, you think it is possible that it is three, three and a half minutes and I know that they can’t put half minutes on but every minute counts at that stage of the game. "You just want a reason but there wasn’t a reason. It is a tiny thing but I am more talking about the mentality that brings to the stadium."